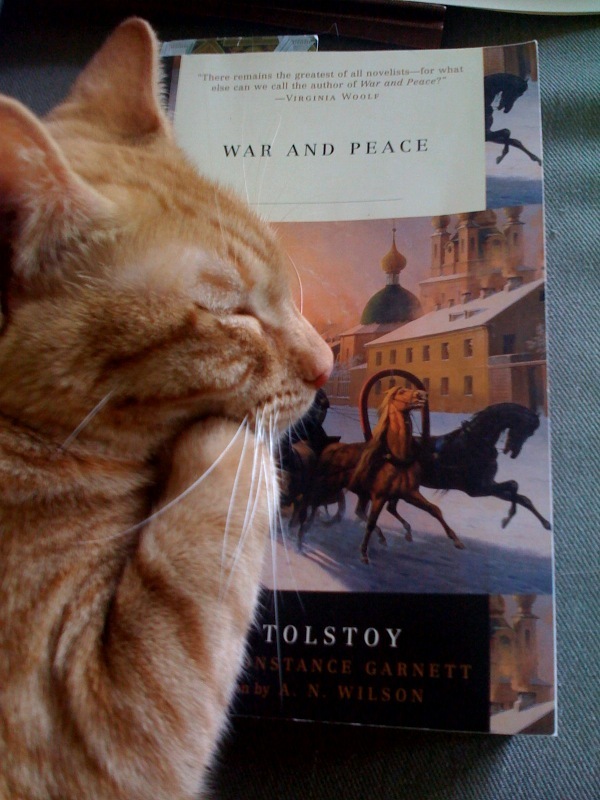 Re-focused Reading Plan: War and Peace – my books. my life. I haven’t had much time to read lately and it was only a two week library loan, so I’m going to have to temporarily give up on T.S. Spivet. I only read the first chapter, so it’s not a huge loss right now. I would like to get back to it someday though. Before picking up another book, I think I’m going to focus on War and Peace. I thought I could read some of it each week and continue to read other books, but it turns out I can’t. I end up only reading the other books. And since Jennifer finished it, I feel inspired to do so as well. I am, however, reserving the right to read something else if I’m still reading it when I go on vacation in a few weeks. Because vacation reading should not be War and Peace. And it is a long car ride to Michigan. Daisy looks so cute with her paw under her chin! And I agree with Kristie…she's a bit bored by the book 😉 You know, you've inspired me to start Anna K. Again. 🙂 Good luck with W&P! Keep going; it's hard work, but it's worth it when you finish, it really is quite something.